I knew TH was the girl for me when I opened up her kitchen drawer and found a well worn cherry pitter. Over the years we have had several cherry trees grow, some die, but most bear amazing fruit. One of the trees that was labeled dwarf at the nursery is now 20 feet tall and we can only get a few of the low hanging branches. The rest go to the care and feeding of the crows. Our pie cherry tree is finally bearing fruit. It is still small, but this year was festooned with beautiful little pie cherries, the ones that really do look like the color of Jolly Rancher candies. TH netted the tree to keep the sparrows off the ripening fruit and last night, I picked all the fruit - one precious pint. 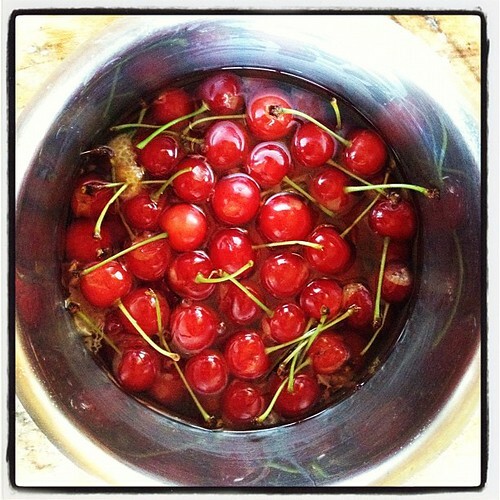 Iranians love cherries in rice dishes and refreshing sharbats (fizzy water drinks flavored with fruit syrups). However, my mother argues that the pie cherries here are not the right ones. Iranians love Morello cherries and those are not seen in residential nurseries as much as the more commonly grown Montmorency. 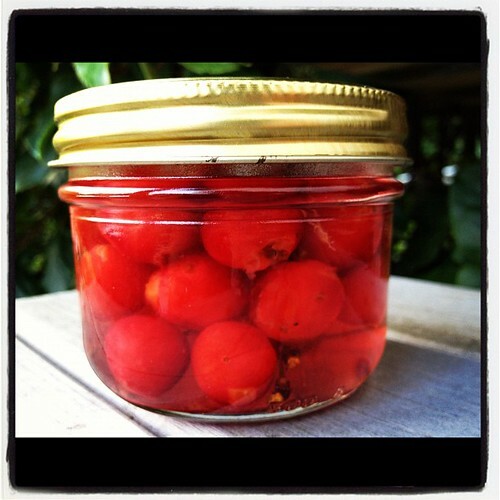 When I was growing up, my parents would fill up the car with blankets, a hot pot of tea, some cheese, bread, herbs and cold meatballs and drive North to Mount Baker, Washington where they had finally located the correct type of cherry. The owner of the orchard graciously allowed my parents and their friends to picnic on the grounds and go out and pick pounds and pounds of Morello cherries. They would return to home laughing and joking about their day. 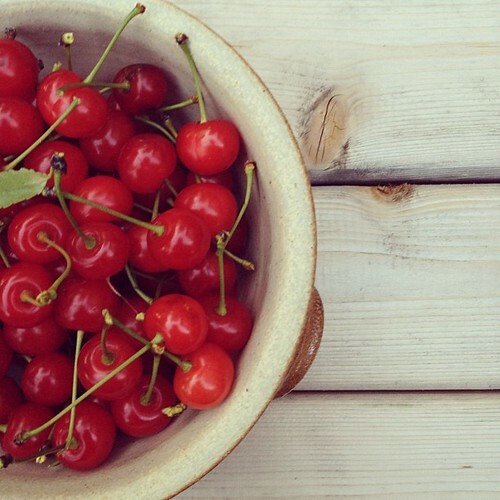 They would later doled out their cherries to friends who weren't able to join them. The moms would start the process of making jam and syrups for the following years dishes. As a teenager, I always avoided going with my parents. It was too boring, or I used the excuse of the Monday test. Today I wish I had gone with them. The orchards have most likely been redeveloped into a strip mall, however the memories remain. 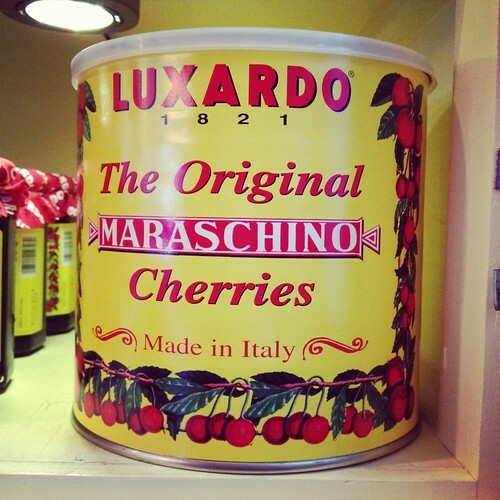 Last year I split a bottle of Luxardo liqueur with my friend Paola, to make maraschino cherries. I didn't get around to it, so I used this tiny stash to try the recipe. I wanted to keep the stem intact, so I had to figure out a way to pit the cherry and keep the stem. I figured it out, while they are not pretty, I think they will be tasty. The real deal. Maceration Nation. The recipe is simple, step by step I used Melissa Clark's method, but I did sterilize my jars and lids. While these will remain refrigerated, its good sanitary practice. Wash lids and rings and jars in hot soapy water, rinse well and place in preheated 250 degree oven for 15 minutes to sterlize. They can be held at temperature for longer if necessary. Place liqueur in stainless steel or non-reactive pan and bring to a simmer. Add cherries and let simmer for 3 minutes. Remove from heat and let cool for 5 minutes. Pour into jars, leaving 1/2 inch headspace, place lid on jar, screw on ring and place in fridge to macerate.Leave for at least two days before tasting. Should make 2 to 3 8 oz jars to keep or give away. I'm going to try mine with some chocolate ice cream and whipped cream and with a Manhattan on the side.